Heat oven to 350 degrees F. Line an 8x8-inch baking pan with foil; coat foil with cooking spray. In a large mixing bowl, using a mixer on medium speed, beat together butter, sugar and melted chocolate until well combined. Add eggs; increase mixer speed to high, and beat an additional 2 minutes. Reduce mixer speed to low and beat in corn syrup, salt, baking soda, mint extract and cocoa powder until well combined. Beat in flour until just combined. Spread 1/3 of the brownie batter into the bottom of prepared pan. Line with Oreos. Cover with remaining batter. Sprinkle chocolate on top. Bake 25 minutes or until well risen, and only slightly wobbly. Cool completely before lifting out foil and slicing into bars. Chill or freeze for easier slicing. 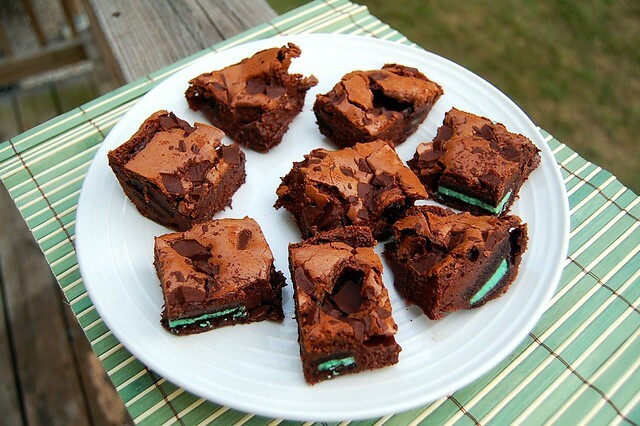 41 comments on "Mint Chocolate Oreo Brownies"
Ah, I love these, Emily! 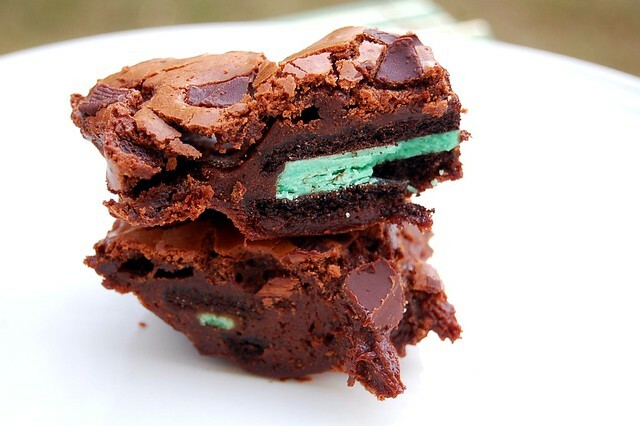 I've never had the mint oreo's, but this would be a great way to try them! Omg those look insanely good! I just made Snickers Bar stuffed Choc Chip Cookies and in my comments, I asked people if they'd ever stuffed anything into anything baked goods and one woman said she stuffed Andes mints into things..and then bam, here you did it with Brownies!!! My mom makes holiday/xmas candy with andes mints. beautiful!!! I love anything mint and chocolate! Love the green popping off the screen from the mint oreo! Yum! I love mint in chocolate. Will have to try these. Great photos too! oh my gosh those look awesome, Emily. You amaze me with your creations! You always think of something else!! Wow they look wonderfuly crisp on top and ooey-gooey in the middle. I love mint choc chip too, it used to be my favourite ice cream. these look insanely good. i always end up reading baking blogs when i'm dieting... YAY ME. Ok, these are amazing. Dangerous and amazing. Just how I like my desserts! Beautiful and tempting as always. I love you Em! We ended up freezing these and they are just as wonderful right out of the freezer. The PB Oreos would be great, too. 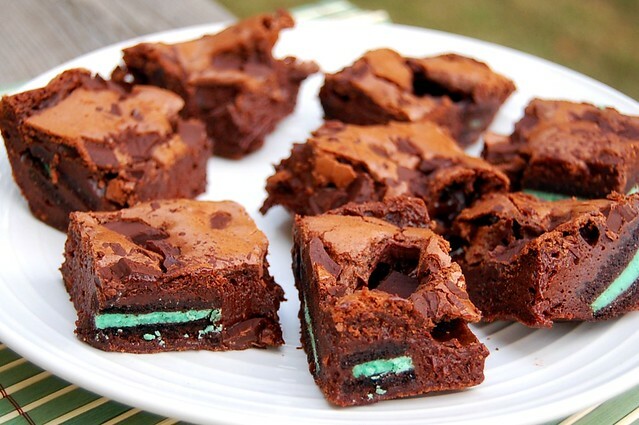 I don't like mint but I can definitely see making these brownies with the double stuffed oreos. YUM!!! Thanks for sharing! And I'm so glad you are happy with your new job! Love these brownies, looks perfect to me... I love mint and chocolate! Thid recipe looks delish. I will have to look for the mint Oreos. I am happy to hear you are really settling inpt your new job and love it. It is so great to go to work at a job that you really enjoy, isn't it? I imagine once you start bringing in delicious baked goods, your co-workers will be thrilled. I remember my ex bf loved mint cc ice cream. I loved it because he loved it. Then we broke up and for a long time I couldn't stomach anything mint-chocolate for a long time. Good thing I got over that. I live in an apartment full of mint chocolate fanatics, so I know that I'll definitely be making these! Your chocolate cake was a hit by the way! I posted about it yesterday. Oh that's it, I'm definitely making these! These maybe need to be featured on one of my posts with a link back to your lovely blog! Wow, those look decadent. I love mint-chocolate desserts too, but don't make them so much because they are indeed dangerous to have sitting around! My husband would loves these! 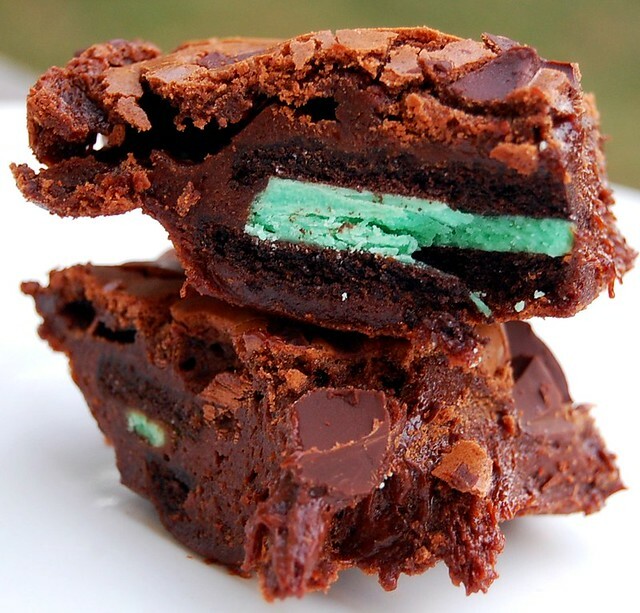 He loves brownies and mint chocolate stuff....and I happen to have some mint Oreo's on hand :). yumm- mint and chocolate are a match made in heaven! I just made chocolate mint brownies 2 nights ago!! But I made a mint layer in the center from leftover filling I had for homemade peppermint patties. They were seriously rich. Mint- chocolate is so yummy...your brownies look great! Those look fudgey and awesome! I love that mint surprise inside. I haven't tried those oreos, gotta check them out. Oh goodness gracious me! I've never even heard of mint Oreo's, fried Oreo's yes, mint, no way!!! I'll be looking for those for sure. In the mean time, I'll be dreaming about those brownies of yours, sinful but oh so heavenly!!! Love your blog, and would love to try these...a couple of questions. I do not usually buy unsalted butter, is salted ok? And not sure if I have bread flour on hand either, so is it ok to use regular?? WOW!! Those look incredible!! At first glance, it looked like you had used the Andes Creme De Menthe Thins that come in the little green foil wrapper. I suppose that would be another variation! So glad to hear that you love your new job!! I still think you need to be on the Food Network staff in New York, however!! Oh my, Emily! These look amazing! Love the mint-chocolate combination. Can I just tell you how incredibly excited I am that I found your blog?! Ah I am in heaven. Thanks for sharing all your recipes! Can't wait to try some! Those brownies look delish!! I love chocolate and mint. Ah! Super fun & unexpected. I'm really eager to try this recipe out. I love your creativity! i'm loving the cross-section and the very idea of these. excellent brownies, emily! Oh my gosh, I just made your cinnamon nutella brownies. SO GOOD! Thanks for sharing! 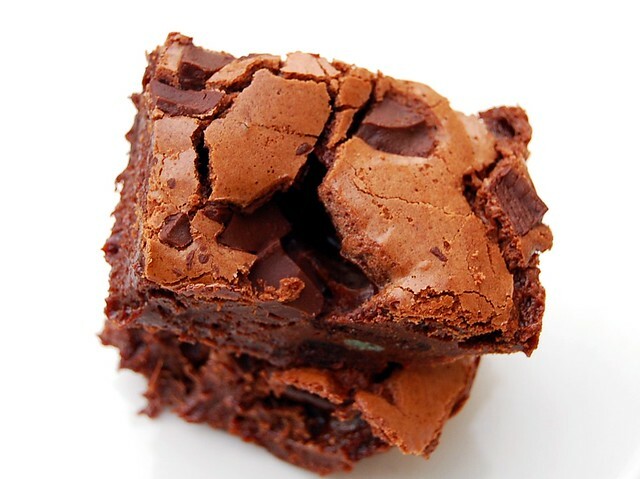 Oh my gosh these brownies look incredible. I want ten... ok twenty. The green of the oreo pops in such a fun way too! I will definitely be trying this recipe asap. Thanks for sharing! Averie, your cookies sound so good! Rachel, I love you too! Anon, it's so nice! I'm enjoying the change! Rachel, of course I will! Anon, I always use unsalted butter. You can use salted, but I would probably cut the amount of salt in the recipe in half. You don't have to use bread flour. I just did because I wanted a chewier brownie. Bread flour has more gluten in it, which equals more chewiness. Yum! the flashes of jade look so good! I don't mind the huge picture (of the mint chocolate oreo brownie) one bit!! The bigger the better!